Caffeine in chocolate comes from cocoa solids. Chocolate made with natural cocoa, which includes milk and dark chocolate, therefore always contains caffeine, making caffeine-free chocolate impossible. 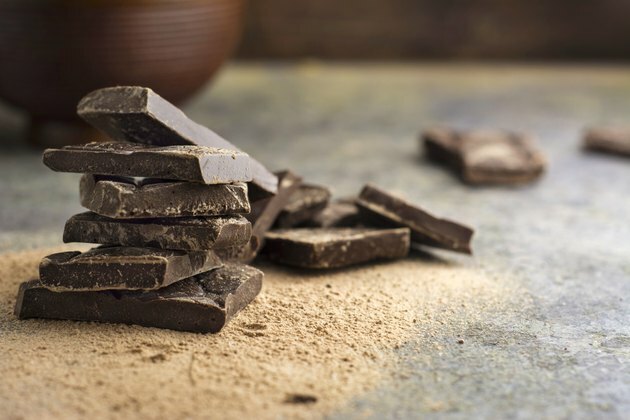 An ounce of dark chocolate contains around as much caffeine as half a cup of tea, according to Health Services at Columbia. The sugar is added during cooking. Since sugar is an added ingredient, some sugar-free chocolate bars replace real sugar with artificial sweeteners. The average milk or dark chocolate bar contains relatively small amounts of caffeine. For example, a small bar of milk chocolate contains 9 milligrams of caffeine, according to the USDA National Nutrient Database. Dark chocolate's higher cocoa content means it can have over double the caffeine of milk chocolate. A small bar of 80 percent cocoa chocolate contains 21 grams. White chocolate contains no caffeine at all as the cocoa content is almost zero. Dark chocolate contains less sugar than milk chocolate, with around 24 percent sugar compared to the 51 percent sugar in milk chocolate. Sugar-free chocolate is often marketed as suitable for a low-carbohydrate diet or as a safe snack food for diabetics. The sugar free chocolate may contain artificial sweeteners in place of sugar. Common sweeteners include xylitol, sorbitol, isomalt and maltitol. Most versions still contain vegetable fats derived from cocoa butter. Some artificial sweeteners have a laxative effect. This means that they can stimulate the bowel to move feces through the colon faster. The result is often uncomfortable bowel movements and a need to visit the bathroom. Some diabetic chocolate in particular contains sweeteners made from chemicals called polyols. According to a report in the BBC, doctors recommend eating less than 20 grams of polyols per day. Yet, some diabetic chocolate contains as much as 6 grams per small piece. Polyols may create a laxative effect. True caffeine-free chocolate doesn't exist. Imitation chocolate, such as bars made from carob or soy, contain no caffeine. However, they also contain no cocoa, so aren't really chocolate bars in the strictest sense. Similarly, white chocolate is made using cocoa butter, not cocoa solids. That means it contains no caffeine. However, chocolate purists also question whether white chocolate is a true chocolate. If you're trying to keep your caffeine intake low, stick to high-milk chocolate or white chocolate.